Bed and breakfast in Kathmandu. All meals while on trek. Helambu valley trek offers a fascinating combination of natural beauty and cultural riches. The best thing about Helambu valley trekking is the lack of crowds, allowing you to commune with nature and really experience the local culture. This trip is specifically designed for those who doesnot have more time for the longer treks. Our representative will take you from Airport and transfer to your hotel. We are going to start the trekking part of this journey today. We drive for about 40 minutes to Sundarijal, the trek starting point. We set off the trail up towards Chisapani, a beautiful place that provides panoramic views of the mountains and natural surroundings. About five hours of uphill trek through forest and village finally takes us to Chisapani to stay overnight. We spend leisurely time around Chisapani once we reach there. The walk today is pretty much easier given its less involvement of steep ascent and descent. Although we have to walk some uphill and downhill trail in some places on the route to Kutumsang today, the trek can be considered as moderate in its difficulty level. As we traverse the trail we can enjoy the view of the mountains in Langtang range. The beautiful walk of the days ends when we reach Kutumsang where we can wander around and explore the place. About six hours of trekking journey takes us to Thadepati for overnight stay. The trail section brings some spectacular views and beautiful experience of trekking. We can enjoy marvelous views of the Himalayas from Yurin Danda and some natural wonders come along the trail today before we reach the destination. 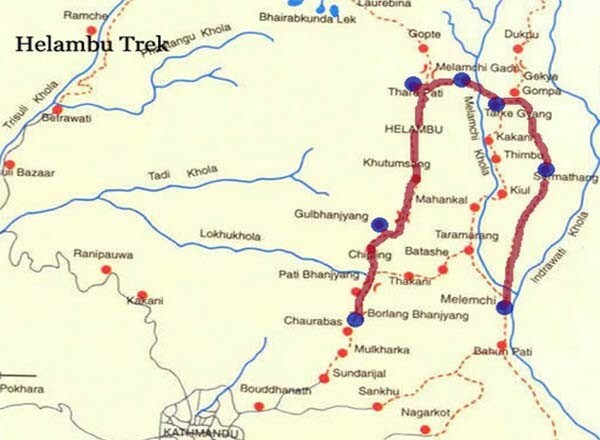 The walk from Thadepati to Tarke Ghyang today is a wonderful exploration of Helambu region. The walk takes us to this beautiful Sherpa village of Tarke Ghyang via Melamchi Gaun in the region. We can explore monasteries and the village once we are in Tarke Ghyang. Tarke Ghyang is an incredible place to observe the mixture of culture and spirituality. We immerse in to the charm of both, culture and spirituality. Sermanthang is another village rich in culture and is full of natural wonders surrounding it. About five hours of walk takes us to Sermanthang. Along the trail, we pass through many other villages rich in Sherpa culture and inspiring simplicity of life. We also walk through some forested area along the trail before reaching Sermanthang for overnight stay. As the final day of walk in the Gosainkunda Helambu region, we trek to Melamchi Pul Bazar. We trek down past many villages with their traditional cultures. We will also walk through terraced fields that people do the farming on. Once we reach Melamchi Pul Bazar, we will stop for the lunch before setting off on a drive back to Kathmandu. Day 09: A free day in Kathmandu for shopping and rest. Our representative will drop to Kathmandu airport.